A big shout out to Brian Carstensen who made this awesome poster for our session! 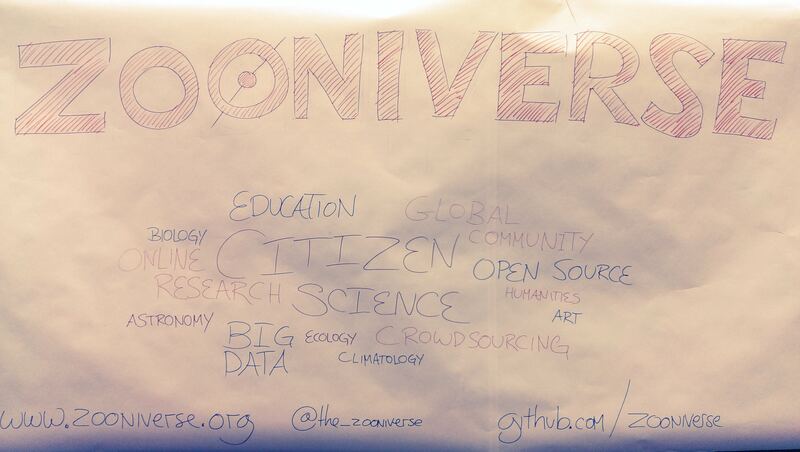 At the weekend a small team (including my good self) were representing the Zooniverse at MozFest 2014 in London. The conference, organised by the Mozilla Foundation, brings people together from all around the world who essentially want to work on making the internet a better place. We were there asking people to help us communicate results from our projects through meaningful visualisations, and to come up with novel ways of educating our volunteers. It was a good weekend and we made many new friends who we can hopefully collaborate with to make the Zooniverse a better platform for all. Is there not another word that a group dedicated to science can come up with besides “awesome” to describe a job well done? It makes you sound illiterate. Excellent! I’m inspired by your efforts. I’m new and very excited about the potential about this project. Btw…I’ve got “Daily Zooniverse” as my homepage.